Latex is made available to the masses readily as it is taken from the sap of rubber. It can be processed using two different methods. The first is the Dunlop method which causes denser, layered latex and the second is known as the Talalay method which causes more homogenous and fluffier latex. The reason for Latex’s popularity as a pillow material is because it molds itself according to the sleeper’s neck and shoulders and therefore also relieves any pain from pressure points, similar to memory foams. Its life expectancy is at least three to four years and it also sleeps cooler than most other foams. Read our latest guide about the best firm pillows. Different ranges exist within the Dunlop and Talalay latex pillows and there are quite a few differences between them as well. For example there might be one piece models that aren’t well ventilated as well as shredded latex pillows that are thicker. Read our latest guide about the best feather pillows. What are the materials latex pillows are made of? Who are latex pillows most suited to? In the Dunlop process, the latex is stirred, molded and then baked as a result of which the sediment gathers towards the bottom and makes the substance more bottom heavy. In the Talalay process, the latex is vacuum sealed, frozen and then baked. This causes the latex to be more homogenous as well as lighter. Manufacturers can use either methods and some even feature Latex using a combination of the two. Sometimes latex can also be referred to as natural or organic and that refers to latex that is made of natural ingredients and minimum petrochemical components. Some pillows can be made from a single piece of latex or even padded with shredded pieces of latex. Some even have zippered covered which allow the owners to add or remove pieces based on their needs and desired firmness. These pillows are the most commonly sold and generally the least expensive too. They are short and the most compact of the lot. These are approximately two inches longer than Standard-sized pillows, which make them ideal for those who think the standard size is too small as well as for people who toss and turn at night. These are ten inches longer than standard size and make it ideal for people who toss and turn and even switch sides while sleeping. They also provide appropriate headrest and backrest for those who like to read in bed or watch television. These pillows are very wide and work for people who like to snuggle pillows as they sleep. Latex pillows conform closely to the head, neck and shoulders which realigns the spine and helps reduce pain and pressure point throughout the body. These provide above average support as they are ergonomically designed and contour to match one’s head and neck movements. Since latex is highly durable, most pillows are able to last for years without losing their shape or becoming flat. 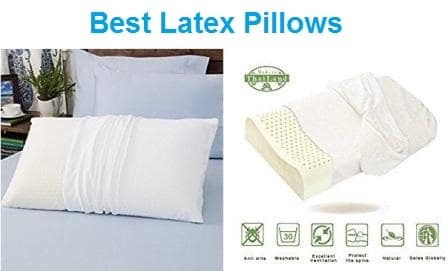 Many latex pillows, especially those that are aerated latex are able to retain minimum body heat and allow them to sleep more coolly compared to other pillow types (such as memory foams). These create minimum noise when they withstand weight which makes it ideal for people who have a tendency to wake up easily through the night. Maintenance is bare minimum as these pillows don’t need to be fluffed, even the shredded latex pillows need minimal fluffing. They should not be machine washed and owners can easily clean spots by themselves without having to worry about paying for dry cleaning. The type of sleepers who sleep on their sides thereby needing enhanced support in the neck, shoulders, lower back and hips. People who sleep on their backs but weigh more than 130 pounds or more since they weigh enough to allow the pillow to fully conform. Those people who tend to sleep hot as latex pillows are cooler than pillows made from memory foam or polyester. Those who experience pain and pressure on their head, neck and shoulders as latex pillows alleviate these symptoms for most sleepers. While latex is either a natural product or a synthetic version of one, memory foam is fully man made with the idea of absorbing weight behind its core construction. Latex pillows are now starting to catch on more in the market when consumers are realizing the amount of possibilities with it. Latex offers a bouncier and quicker response to pressure. It conforms to one’s neck but does it with more buoyancy. It is less dense and also offers less of a sink and more light, supportive light. Memory foam creates a slower response to the pressure as well as a slower sink and conformance to the pressure. The feel of both materials depends on different factors. 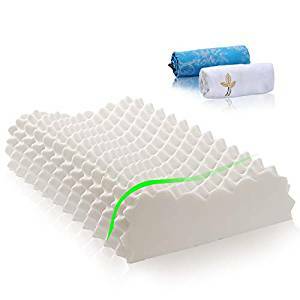 Low density memory foam feels different from high density memory foam but mostly it will provide a slow moving feel, as if one is sinking into the pillow. With latex pillows you feel an instant pressure relief, and feels more resilient compared to memory foam. A common problem with memory foam is that it tends to “sleep hot.” This means that the sleeping area can be hotter than a person would ordinarily want it to be. This is also because of its chemical composition. Meanwhile, the sleeping surface of latex mattresses is more regulated and can cool far more naturally. Latex foams tend to last longer than memory foams and are very durable, often lasting up to three years. Memory foams are less expensive but that’s because they’re made from manmade materials. This is one of the most natural materials and is great for the environment, since it is made from rubber and does not have chemicals mixed into it. Not all mattresses are natural and the synthetic versions do contain chemicals, but you can make an informed decision by asking questions and making sure the origins and the components are natural. You can choose the degree of firmness of your material. When purchasing make sure you ask about the different layers so that you know that you are getting what you want. To do so you should know what each layer is made of and what the reason behind each layer is. Latex pillows are known to be one of the most comfortable options in the market, especially for someone who likes to sleep cooler. 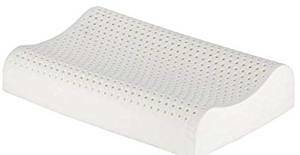 Latex pillows have holes punched in them, and the purpose of this is to create improved air circulation and allow air to flow through which makes it easy to sleep cool through the night. These kind of pillows also resist mold and bacteria growth overtime so hygiene too is not a problem. Ultimately, the kind of mattress you buy depends on you sleeping patterns as well as your budget. While latex pillows may be priced slightly higher than their alternatives, the comfort and durability more than makes up for that. Below are some of our top choices. 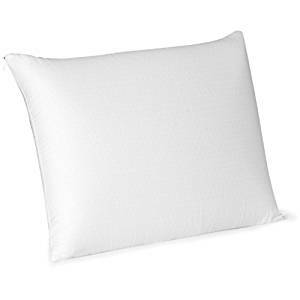 This latex pillow is made from 100% organic cotton and provides the proper support we dream of pillows to provide. Its contour design ergonomically adjusts to its users and correctly aligns the spine by supporting the natural curves of their head, neck as well as shoulders. It is all natural yet has soft firmness. It is made from eco-harvested rubber trees and processed through the Dunlop process. The organic cotton that it is covered with helps maintain its purity and also protects it from off gassing into the free environment. These are hypo allergenic pillows that are resistant to dust mites, bacteria and mold, allowing the sleeper to sleep clean. Organic Textiles, the manufacture, are leaders in creating bedding options which improve the consumer’s health as well as promote environmental sustainability. The contour pillows are designed with curves that adjust themselves to the users head, neck and shoulder. Consumers also benefit from the support of the pillow as well as further improve the comfort of the latex. It also helps reduce neck soreness and stiffness, leading to a much more relaxed and comfortable sleep, an inexpensive alternative for what could be a chronic health problem. It comes with a washable organic cotton cover and its holes help improve air circulation, providing a cooler sleeping experience. The latex foam is hypoallergenic and chemical free. It is also well ventilated and helps reduce overheating which improves the users comfort as they sleep. The organic latex contour pillow also helps relieve pain by reducing pressure on the joints in the neck and back and also reducing discomfort during sleep. 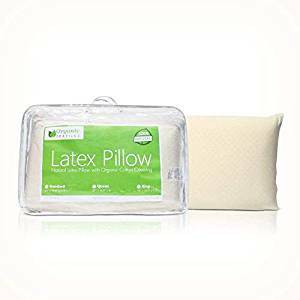 The latex foam also retains its original shape and lasts far longer than any traditional pillow, meaning that it provides consistent support reliably through its entire lifespan. Its specifications are 25 x 16 x (4/5) inches with some variation in size due to its packing and shipping. Helps prevent headaches or cervical issues. It is soft, yet firm and supportive. It is well ventilated and does not have an odor at bedtime. It has a smell originally which can easily be gotten rid of if one airs it for two-three hours. The Malouf allows your head to sink into the pillow easily, creating a softer sleeping experience. It is 6-7 inches high creating a high loft which is perfect for people who sleep on their sides and even those who like to sleep on thicker pillows. It is made of 100% pure natural Talalay latex which is derived from sustainable latex trees and includes no additional synthetics. It has unique foam consistency as well as zoned technology which provides zoned support as well as increased pressure relief. It is also mildew proof and dust mite resistant and well ventilated in order to improve breathability and comfort. 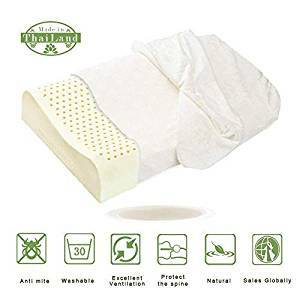 The cover is removable and made from 100% natural cotton which creates a crisp, clean and breathable surface on which a user can rest their head. It also has a five year U.S. warranty. It is available in some different textures which provide a different type of feel. It is available in high loft plush, high loft firm, and low loft plush and low loft firm. The traditional and soft versions are not springy as is usually expected from Talalay latex. The high loft and firm options also feel lighter and are more responsive than regular memory foam pillows. These pillows are created through an ecofriendly manufacturing process whereby the manufacturers use latex which is derived from sustainable rubber trees. The milky sap that is tapped from these trees is then whipped and then poured into a mold and chilled. It is also finally heated in order to be able to set the unique foam consistency. The zoned technology provides a combination of comfort and support through pin-core design which is made ergonomically to cradle one’s head, neck and shoulders with the support it requires. Because of this unique production process, Talalay is considered the most resilient and consistent latex. It is mildew proof and anti-microbial. It naturally returns to its original shape when not in use. The pillow molds to one’s head. It is supportive and adapts to different sleeping positions. Over time it loses its support. This is a latex pillow designed to help you sleep peacefully and make your bedroom extra cozy. The pillow is extra firm and provides a comfortable night’s sleep for people sleeping in any position. It is encased in a sateen zipper cover which also has a cozy feel yet it still maintains its extra firm support. It also has microbial properties which help ensure that it is clean and also washable with a machine. It has a supportive bedding feature with 250 thread count sateen zipper cover. It is also extra firm because of its 100 percent latex. Its dimensions are 18 inches x 26 inches for the standard pillow, 18 inches x 29 inches for Queen and 18 inches x 36 inches for King sized. Side sleepers find it difficult to rest their head in a position that is comfortable for them. For such sleepers Simmon’s comes in exceptionally handy because it has a unique option for those side sleepers looking for something that is both robust yet comfortable. It relieves pressure points as the primary feature of the pillow is to be able to relieve pressure points on the body. It does this by allowing the body to sink in which creates a calm, soothing effect while minimizing the stress on the body. The neck and the head are the most impacted in situations where the head is resting on the wrong type of surface. This is why a pillow makes a huge difference in the long run as it allows the body to settle in its natural element and stay that way throughout the user experience. The main feature offered by this pillow is its natural latex. This is especially important for people who want a soft, smooth and reassuring experience throughout the night. The pillow is soft yet firm and protects one from feeling irritated no matter how long it is used for. It also has a long lasting impact on the body and how it performs in the long term. It also has a bounce back structure in order to ensure that the pillow’s body doesn’t flatten overtime. The natural latex also works well as it doesn’t grate against the body, creating a soft texture. It is easy to navigate and relieves pressure points. The fact that it doesn’t sink is a plus point for side sleepers. It has an initial smell which takes a few days to dissipate. The Beautyrest Latex foam pillow is made from 100% cotton and is crafted using natural latex foam that comes from a tropical rubber tree. It limits odor as well as pathogen development due to its antimicrobial properties. It alleviates any pressure from the joints by cradling both the neck as well as head throughout the night. It is easily washable and has a 300 threat count as well as a 100% cotton removable cover. The latex pillows come in a package of two with dimensions 33″ x 26″ x 5.5″. It is also made from natural antimicrobial latex form which comes from tropical rubber trees and this quality helps eliminate odors and bacteria. It provides complete comfort every night to those who use it with long lasting freshness guaranteed. It provides complete comfort and supports the head and neck areas throughout the night, by correcting one’s upper spine. It also has a bounce back feature that creates increase resilience by protecting the body shape and ensuring full comfort. The pillow also adjusts to the shape of one’s body and keeps creating the optimal level of targeted support. The foam is fully manufactured in USA and laundering it is simple due to its easy care. The pillow is machine washable and can be cleaned easily. It is made by Hollander Sleep Products who are the largest suppliers of bed pillows in North America. It also provides high quality bedding items that help bring comfort to people’s lives all over the world. It is among the top options of latex pillows throughout the world as it provides both softness as well as support. The cover is machine washable and made from 100% cotton which increases both comfort as well as ease during cleaning. 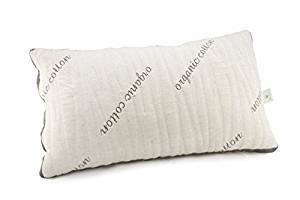 It is lightweight as it weighs approximately two pounds, which makes it easy to carry it around compared to its contemporaries (latex pillows are known to be heavier). It is firm and able to retain shape. It has medium firmness for those who sleep on their back and sides. It has different lofts which can cause inconsistency in experience. This All Natural Latex pillow is made out of the best materials, better than memory foam, gel filled or even down alternative. It provides comfort and support to one’s neck and head as it is made purely from latex. The material is strong and is naturally resistant to dust mite and mold. It is also one of the most hypoallergenic bedding options, which allows one to sleep extra comfortably. Any latex pillow should be able to breathe freely, which is where the cotton pillow cover. Synthetic fabrics are able to retain heat and if the covers are too thick, can reduce overall ventilation by increasing pillow warmth. These pillows include an organic cotton cover which creates air circulation to help keep the pillow cool. Most pillows flatten out after just a few weeks, this can be a struggle for sleepers who are looking for a more durable solution. These latex pillows are designed in order to keep the pillow plush, soft and lofty, which allows users to get a good night sleep for many years. Its sizes are Standard 25″ x 16″ x 5.5″, Queen 30″ x 16″ x 5″, King 34″ x 16″ x 6″. While this pillow is great, it is not ideal for those who have latex sensitivities. Initially it also has odor but once it’s well ventilated, the odor can escape the pillow. It is made from specialty organic and environmentally friendly textiles which are dedicated to excellent consumer health and are also environmentally friendly. What sets them apart if their expert knowledge as well as their dedication to provide excellent products. The organic materials also have long term health benefits which further improve their health as well as living. The latex pillows are made from high quality natural latex and don’t have any hint of memory foam, synthetic materials or latex. 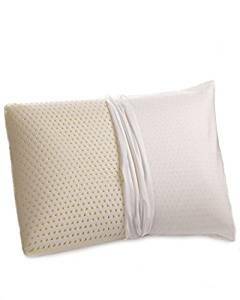 The washable cotton pillow cover as well as the unique body heat regulation Pin-Core design help people maintain a regular sleeping temperature. It has a loftier feel i.e. the head settles in easily yet provides support. It is great for people who sleep on their back. It reduces tossing and turning. It’s too soft and doesn’t offer much support to side sleepers. 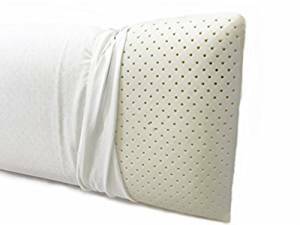 Sleep Artisan natural latex Queen Pillow is a lost based pillow manufactured in America and made from the highest quality materials. It also has the highest quality standards as the pillow is built to keep its shape and never to go flat. 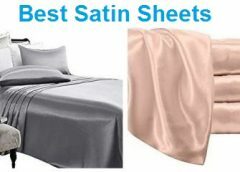 Because of this, the user has undisturbed and healthy sleep due to the proprietary blend of natural Latex and poly silk which is dust mite resistant, non-allergenic as well as anti-microbial. The pillow cover is made from a mixture of organic cotton and polyester. It is fully customizable and can create the perfect fit. It is built to create a firm and high loft. The cover can simply be unzipped and the fill can be removed in order to adjust the perfect fit from firm to soft or even in between, depending on your own requirements. It is non-toxic as the manufacturers do not use petroleum based chemical foams in the pillows which means there is no off gassing or chemical smells. It comes equipped with a hassle free satisfaction guarantee as well as a ten year warranty. The manufacturers are known to create products that contribute to a healthier lifestyle and also provide better sleep. The cover is made from a certified blend of organic cotton, hemp and polyester after which it is made of a blend of natural latex noodles and poly silk micro fiber. It provides a sound night’s sleep as its construction ensures that the pillow supports one’s head, neck and even back muscles. It is incredibly soft as it made from premium materials, a matelassé cover with no chemicals and adjustable loft. The pillows can be created to your ideal blend with just the right amount of firmness, because the company ensures that they craft every single pillow that is produced. It is soft, supportive and customizable. The pillows do not have any bad smells. The writing on the pillow is very visible. The fillings should be encased so that the outer cover could be washed easily. The All Natural Latex Premium pillow is made from 100% pure natural Talalay latex with no additional additives. 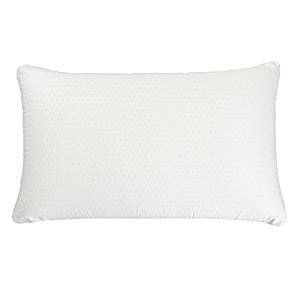 It is soft, plush and made from natural latex pillows that are designed for people who prefer softer pillows. It is made from the highest quality latex (100% natural) and is renewable eco-friendly. It is able to maintain a comfortable sleeping condition based on its design as well as contents. The air flow design is free and has a hydro-phillic covering which helps keep them cool. This reduces the hot flashes and the heat that is a result of memory foam. It also reduces perspiration through wicking away moisture and works for all seasons. It is cool during the summers and warm enough during winters. It is also resistant to dust and mildew. It is hypoallergenic and anti-microbial, reducing the growth of harmful bacteria. It has a 100% organic cotton covering. All natural soft Talalay latex does not contain any synthetic materials which is an important point to consider when purchasing pillows. It is covered with clean and all organic covering which helps give it organic purity as well as softness which helps last over the pillow’s lifetime. The zipper organic covers are also washable which helps make the freshness last. All these pillows are built to maintain shape and size even over a course of five years. This is because it is built with an organic covering which provides comfort and organic purity and softness which can last for as long as the pillow does. It is made from the milky sap of tropical rubber trees and then these pillows are made from superior unique natural saplings which then provide superior support, comfort as well as durability. The pin core design further creates excellent ventilation ensuring that the pillows are sweat free no matter what the season. The latex also offers a contouring as well as cradling effect, making sure one’s neck and back is fully protected. It protects the head from heating up. It is very comfortable with the right amount of loft. Overtime there can be some indentation. The Alpha Latex pillows are made from imported materials, their raw materials come from the extract of rubber trees grown in Thailand. These pillows are perfectly designed to bounce back from their original form after each night’s rest. It has a low and high ergonomic design where the low side of the pillow which is perfect for back sleepers while the high side works well for side sleepers who are either a little larger or like higher pillows. It also improves ones quality of life due to the hypoallergenic and antimicrobial natural latex material. The natural latex material cam resist dust mites as well as mold growths and mildew. It is perfect for use for the entire family, even those who are suffering from asthma and allergies. The pillow core is also comfortable and breathable as it consists of many interconnected air cells which help keep it cool during the summers and warm during the winters. The airflow is further accelerated as well in order to ensure a more comfortable and secure sleep. It also helps alleviate physical and mental stress by relieving muscle tension and cervical spondylosis and helps one relax after a long period of work. Rest assured, you are going to enjoy a night of deep slumber. The natural latex material is made of material with high elasticity which allows it to spring back to its original form after it’s been used. Its ergonomic design helps provide support to its head, neck as well as shoulder and it also alleviates pressure, stiffness in the upper body as well as soreness because of long time work. With prolonged use it can help correct the status of the cervical spine or even lumbar. Its free air flow design also has a covering which allows it to cool and even reduces sweat by wicking away moisture. The package includes a pillow core, an inside cover and an outside cover. It is very soft and the firmness is perfect for side sleepers. The edges of the pillow are rough. The e-luxury supply Beautyrest latex pillow is made from all natural-construction. It uses natural latex foam which comes straight from tropical rubber trees. Its pillow dimensions are 33” x 26” x 5.5”, following the dimensions for a king sized pillow. It is hypoallergenic and antimicrobial which means that it inhibits odors as well as pathogen developments. It relieves pressure at certain points as it helps protect the neck and head throughout the night and provides a comfortable sleeping environment. Customer satisfaction is guaranteed and also a top priority. In case customers are unhappy there is a money back guarantee. The mattress uses two layers of foam and measures thickness at about five inches, which is in line with other mattresses and is perfect for providing support to light sleepers. It is available in both king and queen sizes and it helps relieve the sleepers at pressure points. It also provides durable construction made of quality materials. The natural latex material is gathered from rubber trees and offers a built-in antimicrobial property, which prevents the buildup of odors and unpleasantness. It also provides gentle support to one’s head and neck throughout the night by aligning the body with the upper spine. Because of its construction, users do not need to fluff the pillow throughout the night. This is because the latex is resilient and its cell structure is equipped to bounce back. This means that it minimizes how much it is flattened and it maximizes comfort levels. The cover itself is made from bamboo velour and is extremely comfortable due to its thread count. It is soft yet firm and ideal for back and side sleeper. The zipper protector provides finesse and a nice finishing touch which keeps the pillow safe. It can also be removed for laundry. It provides excellent support to back and side sleepers. It does not have any pungent odors. Its honeycombed construction leaves room for air exchange. They are flatter than other pillows but are able to retain their firmness. The Sweesleep pillow is made from natural Talalay latex and has an out cover of 300 thread count. It is also made from 100% breathable cotton and comes with a zippered cover. Its inner cover is made from 100% polyester and also has breathable holes. It is soft, yet firm and is able to support your head while still providing extreme comfort. The latex it is made from is natural and breathable as it does not absorb body moisture which means that it can remain dry and is easy to clean even after it has been used for several years. 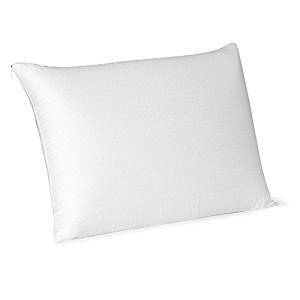 These pillows are able to retain their shape and since they are hypoallergenic, it is great for people with allergies. It is resistant to bacteria, mildew and even dust mites. However, anyone who is allergic to latex should keep away from this pillow. While it does have a natural smell, it is harmless and a rubbery scent which remains upon arrival but can be removed if the pillow is breathed. All one needs to do is let it out of its packaging and it is to be aired out. It has also been given the Eco Institute Certification for meeting Oeko-Tex standards. It also has a five year limited manufacturer warranty. It is made from natural rubber and its dimensions are 28 x 15.5 x 5 inches. It weighs 3.06 pounds. The package includes one latex pillow and one cotton cover. It is also a member of the International Sleep Products Association (ISPA) and is known as a leader in the mattress industry. It is advised that the pillow is hand washed with a slight flap and should carefully be removed from water. It should be air dried, not sun dried and should not ever be machine washed. In order to get rid of the rubbery smell, one can also sprinkle their pillow with baking soda. The smell airs out fast. Its weight, density and compression works well for neck and shoulders. It is soft yet supportive. It is not for back sleepers as it is too thick around the middle. The pillow type is Talalay Latex and the fabric construction is 100 percent cotton cover with a zipper closure. The fill material is 100% latex and it has a firm feel. It is 18 inches wide x 30 inches long with 34 ounces of fill and queen sized. All users are advised to not mash it as it is made from sterile hygienic material which does not require washing. At most it should be spot cleaned while the cover is still machine washable. This pillow helps the user get the night’s sleep they are looking for with this soft density pillow. It is ideal for people who sleep on their stomach’s as the pillow is both antimicrobial as well as hypoallergenic. The fact that it is hypoallergenic makes it safe to use for people who have allergies or even other types of sensitivities. The latex pillow is constructed and is sealed with a knife edge which helps increase the pillow’s durability. It is made from 100 percent cotton cover which provides extra softness. It takes up to five days for the smell to go away completely but rest assured it will. They are made of complete latex which makes it firm, especially for side sleepers. It helps people keep their head straight without sinking down. These pillows could be considered higher than others which could take people some time to get used to but once they do, can be rather enjoyable. This is because latex is different from regular memory foam as while it compresses under your head, it does not flatten with its weight. It allows one to keep their head above the mattress by several inches. In case you are looking for a softer pillow, you should go for the medium version. It is exceptionally comfortable for side and back sleepers. They are pricier than other pillows but worth the money. It is cool and breathable. It is firm enough and is the right size for side and black sleepers. It can’t be washed because it takes approximately a week to dry up. The Cardinal and Crest Natural Latex pillow is made from an all-natural construction and uses natural latex foam that is available from tropical rubber trees. It is available in the following dimensions: 29″ x 18″ x 5.5″. It is hypoallergenic and antimicrobial, which means that it helps inhibit odor and pathogen development. It is also a pressure point reliever as it helps relieve the pain in one’s head and neck because of which one is able to have a more comfortable and soothing night’s rest. Every customer is guaranteed complete satisfaction, especially because of the money back guarantee. The pillow is made from natural latex derived from the tropical rubber tree as this pillow offers built in anti-microbial properties which further reduces bad odors as well as bacteria. The design is built to support one’s head and neck throughout the night which helps support the upper spine. People do not need to fluff their pillows ever again because the latex is resilient and it bounces back easily due to its construction and cell structure. It has removable 300 thread count, 100 percent cotton cover and is completely machine washable which helps keep the pillow clean. The pillow is 5.5 inches thick and is 4.05 lb. in weight. It is made of latex which is relatively dense. No matter what your neck problems are and even if you have had surgery, this pillow will make you feel like a dream. It contours to the shape of one’s head and it remains cool throughout the night. It is soft yet durable. It is soft yet durable. It is great for people post surgeries. The air holes are cooler than other competitors. It is too soft for side sleepers. It could be thin for people used to sleeping on higher pillows. The Elite Slim Sleeper is a thin pillow which is just 2.75 inches tall. It is perfect for people who are used to sleeping on their stomachs and is made from 100% natural latex. It is hypoallergenic, anti-microbial, mildew resistant, anti-dust mites as well as anti-fungus. The pillow comes fully equipped with a cotton outer cover. It is made from ventilated/breathable material and the pin-hole design helps create cooler and more comfortable sleep. Its dimensions are 16″ x 24″ x 2.75″, making it extremely low profile. The comfort level is guaranteed to make one sleep through the most difficult of nights in deep slumber. For some people finding the right pillow can be a real nuisance. They go through pillows that are too thick, firm, soft, how often does one find a pillow that is just right? With Elite Rest Slim Sleeper, the user finally gets what they want as this is actually low profile. It is made from latex foam and is perfect for stomach sleepers (Although it also works for back and side sleepers). It is made from medium level firmness. It is considered to be one of the thinnest pillows in the industry and it provides extra support without the user having to lift their head too far forward when on their back or too high when on their stomach. This is also a great choice for people who sleep on their backs and stomachs due to the low loft as well as the soft contour which helps provide increased support and comfort. It is well packaged in its own plastic zippered case and which it does have initial off gassing, it quickly dissipates if it is aired out. The breathable cotton fabric cover is also washable and it helps provide a cooler night’s sleep. The seams are well stitched and even the zipper lays flat. So long as one is careful to pull it gently, there will be no extra strain on the zipper. It is great for stomach sleepers. It creates great contouring without flattening. It is among the thinnest. It might be too soft for some. The UUQ is a latex foam pillow which is made from 100% natural latex from Thailand. The latex is obtained from rubber trees and is also known as the white gold of Thailand. This is because it is made from premium rebounding material which is great for pillows as it aligns one’s posture when they sleep and it even supports their head and neck in order to provide the best comfort. It provides both low and high ergonomic design where the low side is perfect for back sleepers while the high side is perfect for side sleepers who are relatively larger or even if they prefer higher pillows. It provides a medium feel and is also lightweight. The medium weight works well as if a pillow is too soft it does not support the neck and head feel supported. Meanwhile if the pillow is too firm, it makes people feel uncomfortable. The medium feel provides a feel that is ‘just right’ i.e. superior support while alleviating pressure. It is also consists of many interconnected air cells which creates a breathable pillow i.e. it remains cool in the summers and warms in the winters because of its airflow. This airflow also allows heat and moisture to leave the pillow and create a more comfortable sleep. It is hypoallergenic as well as antimicrobial which makes it perfect for asthma and allergy sufferers. 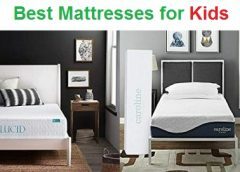 It is also resistant to dust mites and also prevents the growth of mold and mildew, creating a healthier environment to sleep in. It also comes with a lifetime warranty. People do not need to wash the pillow, in fact if they do end up washing it, it will end up looking more yellow. The pillow is long lasting and biodegradable. The synthetic latex is made from oil derivatives as well as chemicals. It has a slight U on the shape of its surface which makes it contour to one’s head shape. It is supportive yet squishy. It comes in a protective white zippered case. The smell takes a while to go away. This pillow is perfect for people who want to sleep comfortably on a very soft pillow. It feels like sleeping on feathers and does not trap any heat. It has the unique quality of providing extreme comfort by adjusting to the position you sleep in immediately. It does not create any delays the way memory foam does. It also had no chemical additives which means that people can sleep peacefully without worrying about any toxic off gassing. It is also designed comfortably with high air ventilation. It is resilient and comes with a pressure point relief system to ensure comfortable rest. The pillow has no harsh chemicals and strives to provide deep sleep without hurting one’s health. It is pure, anti-microbial, and hypoallergenic and dust mite resistant. The pillows avoid using any harmful chemicals as none are used in its production. The approximate sizes are Standard 24″ x 16″ x 6″, Queen 31″ x 16″ x 6″, King 35″ x 16″ x 6″. The package includes one pillow. It is well ventilated and creates a supportive pin structure which creates an excellent sleeping environment by alleviating pain. The cover is removable and it comes with a zipper. It is less dense compared to others and is the right amount of density. The non-removable cover is a great add on to the latex pillow and helps keep it clean. It conforms to the user. It can be harder for some who are expecting more of a loft.